Reopening the controversy, Consumer Reports has chastized review competitor Edmunds for failing to use a Ford-certified repairer in its high-profile report of a January sledgehammer test but acknowledged the expertise needed to work with the metal. Consumer Reports’ Jim Travers writes that replacing the panel — the cost for the panel is the same for aluminum and steel ones — would have been a simpler and quicker solution. 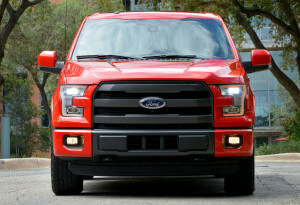 The F-150 was designed to be modular for easier repair, Fields observed on the call. Fields also said the dealership, Santa Monica Ford, wasn’t certified under Ford’s aluminum program, and Travers said Edmunds was sloppy in not bringing the dealership to one certified by Ford to work on the aluminum truck. Though Ford also acknowledges noncertified shops know how to work on aluminum, according to Traves. Controversy aside, the strength of the aluminum on the truck is impressive. It rebounds pretty impressively in the Edmunds video. Ford also has offered an amusing demonstration of the aluminum damage-resistance difference by having athletes attack F-150s. “As with any vehicle in Edmunds’ Long-Term testing fleet, our F-150 experiment was designed to simulate a service experience of any regular truck owner. Like many of these owners, we took our vehicle to the nearest Ford dealership for the repairs. The service advisor said that his facility could handle the repairs, and we trusted him to get the work done. Consumer Reports also touched on its earlier report that independent shops scored higher in customer satisfaction than dealership ones, though dealership ones were still well-regarded. It indicated that in the case of the F-150, using a certified dealership shop might your best bet but also acknowledged that independent collision repairers would be up to the job if they too were certified by Ford.